The implementation of the HSE&S Policy across all operations, sites and businesses, is through the ICI Pakistan Limited Health, Safety, and Environment & Security Management System, which is fully integrated into the Company’s scheme of organisation. 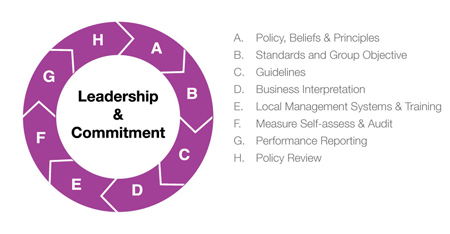 The key elements are the Policy, Standards, Guidelines, Local Management System (Procedures), and Training Management, Self Assessment & Audit, performance reporting and policy review. The system augments, but does not replace HSE legislation applicable to Company activities. Line Management is responsible for HSE&S performance, the implementation of local regulatory requirements and the ICI Pakistan Limited’s HSE&S Policy, Standards and Guidelines. Trained and Involved, Contributing to HSE&S Improvement, “Competent & Motivated”.